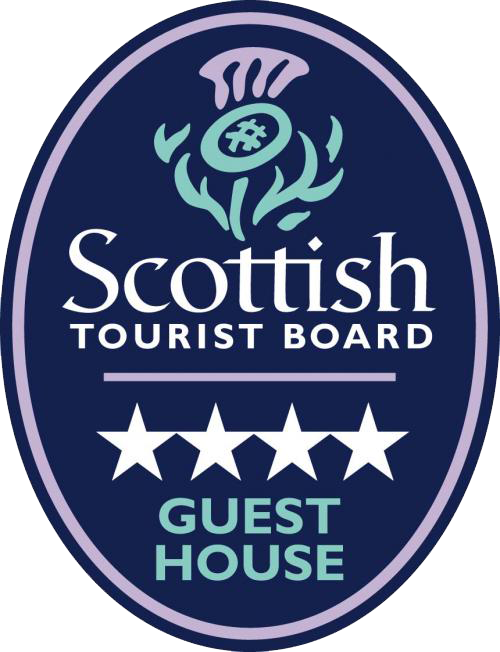 Stornoway Bed and Breakfast offers guest house accommodation on a quiet backstreet in Stornoway town centre from two properties, 29 and 32 Kenneth Street and Self-Catering in "The Stables", to the rear of 29. We are within a couple of minutes walk of both the ferry and bus terminals, An Lanntair Arts Centre and all shops, pubs and restaurants. Stornoway Golf Club, Lews Castle and the new Museum nan Eilean are ten minutes walk away. In total, we have eight warm and comfortable en-suite rooms. Start your day off with our hearty full cooked Hebridean breakfast or something lighter. No 29 is a 175-year-old listed building (room 4 is quirky with low ceilings) and features the original exposed stone walls downstairs. No 32 is across the street. Both are recently renovated to incorporate all modern facilities including gas central heating. Each bedroom has digital TV, and there is free wi-fi internet in both properties. Parking is on street. Breakfast and check-in are at No. 29, as is the lockable cycle shed and guest's washing machine and drying room. Free wifi internet throughout. Whether on a working trip, visiting family or exploring our island, you will find our B&B and self-catering accommodation ideal to meet your needs. You are guaranteed true Hebridean Hospitality. "Stayed here for a couple of nights during a week long trip round Lewis, Harris and Skye...and would be back.Room we stayed in has been recently refurbished and has been done well. We stayed in No. 32, which is across the street and along a little from where the breakfast is served - it's only a 90 second walk so nothing too strenuous. No 32 would also suit a group, or family, stay as it has an open kitchen, dining and lounge area that would easily suit 6 or 8.Hosts were great and friendly, making us feel really welcome and the quality of their breakfast was good as well.We were initially concerned about the yellow lines on the road and being able to park nearby, but were advised that it wasn't an issue for the duration of our stay.All in all, a good stay and would go back again." "I was made to feel very welcome and Graeme was extremely helpful. I had a lovely overnight stay. Beautiful accommodation in a central but quiet location. I will recommend to others and i would definitely stay again. Perfect!" Double bed (1350mm) , single occupancy, en-suite, including cooked breakfast. Single person en-suite, including cooked breakfast. Double bed (1350mm) is accessible from one side only. First floor room to rear of property.